The world's scariest roller coaster? Known locally as 'The Orphaned Rocker', the big dipper (or roller coaster) at the Katoomba Scenic Railway has never opened to the public & is an object of curiosity, rumours & criticism. According to one correspondent..... "In about 1990 or thereabouts, I remember watching a short lived Australian show called Just for the Record, similar to Guinness world records but not as high profile. Anyway, it had a story on the Orphan Rocker as the world's most dangerous or scariest roller coaster. The presenter and film crew rode the coaster and I remember them saying that, during testing, sand bags used to mimic people were missing when the ride returned." A source connected with the local council told the author, in 2000, that council approval for operation is dependent on the operators obtaining appropriate insurance, which had not happened. On council insistence, the track has been re-painted so as to be less conspicuous. Unreal! When is it opening? It is "totally inappropriate to the site", should never have been built, & should be dismantled. One correspondent observed it being constructed in 1983. "I have my own theory as to why the Orphan Rocker never worked. I have cause to believe (given that I had observed employees of the Skyway working on the superstructure on numerous times) that a proper roller coaster manufacture/builder was never engaged to undertake the project, hence the problems. A car plunged over the cliff on a test run. Not true. The roller coaster was never approved by council, the owners expecting to get it cleared later on appeal. Probably not true. The designer was not a properly qualified engineer. Apart from a ride around the grounds with a few steeply banked corners? The highlight is plunging down onto a peninsula, with cliffs on three sides. The track makes a steeply banked U-turn at the edge of cliff - those sandbag 'passengers' mentioned earlier had about a 200 metre fall into the valley! I am the owner and designer of the Orphan Rocker. It has been a long development process for a very complex and interesting project. We have been working on it for an unbelievable 10 years now! What started out as a relatively simple idea has become quite a complex exercise, needing to comply with the Australian Standard AS3533 which was being worked up as we were developing the ride, consequently quite a few revisions had to be made as we went along. 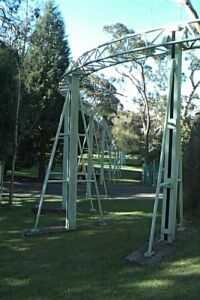 This was the very first roller coaster designed and built in Australia, and fortunately we came across an engineer in Melbourne who was working up software to analyse another imported coaster being installed in Brisbane. He used our coaster as a test bed for the software, and this also took up quite a lot of time. We are now on the very last leg of this exercise, having to rebuild the passenger car gimbals bearings (all 20 of them) as they had not been originally built to the correct specification. The urban myth that David has passed on to you, is not correct of course, we have successfully completed about 500 circuits, in between many rebuilds of both track equipment and train parts. A section of the track. Note the steep banking on the curve. 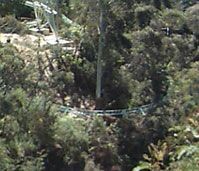 The track can be seen climbing up on the right, then cutting across the picture to the left. This is where the cars are being propelled to the summit. The cliff-top U-turn, where a dummy passenger was hurled into the valley! The Orphan Rocker gets it's name from the nearby Orphan Rock. 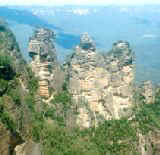 The Orphan Rock is a prominent rock formation jutting up out of the valley near the main cliff- line.